Additionally, please check the new development for the FPGA based decoder. At the moment there are just a few PICADSB9 kits or PCBs left over, and I will not order new ones but instead concentrate on the next generation. Your miniADSB receiver will not become obsolete but a very good extension of that. A web page will be set up as soon as the prototypes are available. Expected availability in higher numbers is end of this year. ADS-B telegrams, as they are sent from aircrafts on 1090MHz, are widely used as source for a passive radar system. While in the past the few commercial units that were on the market appeared quite expensive, Andy presented here a receiver which has a quite reasonable price and also a very good performance. 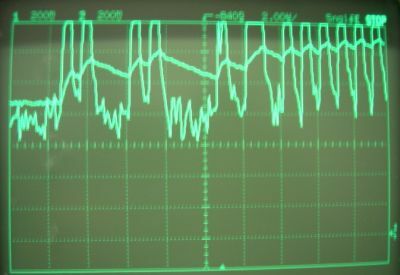 The receiver's output, which actually is a signal level indication of 10MHz bandwidth around 1090MHz, requires a decoder which transfers the telegrams into a format that can be understood by common MMI software, such as COAA PlanePlotter. There are mainly two decoders known, an ATMEL based decoder solution and the PIC 18F2550 solution by Bertrand Velle, which I choose as basis simply because I have a very handsome PICKit-2 programmer. I also added an RS232 to USB converter in order to interface easier to all PCs, to connect several units to one PC, to provide power and, as it developped over time, also to increase the data rate by a significant factor. This development would not have been possible without the response of the users. All experience that is brought into this circuit was only possible because it is widely used and the bottlenecks were discovered by using it under various conditions. The recent PICADSB9 meanwhile shows to be the very best of all, doing its job pretty perfect and satisfying all requirements. Since the improvements were mostly done at the AD converter, I provide all information how to modify the elder boards in case that you have problems with nearby planes (doughnut effect) below. As soon as a lately discovered bug in Planeplotter's local decoding is removed, I can show the range that I can receive with my simple setup. For the future we are planning a few more improvements, but these will require some more time to develop, also much time has been spent for this project and other things had been dropped, so it will be a little bit slower. 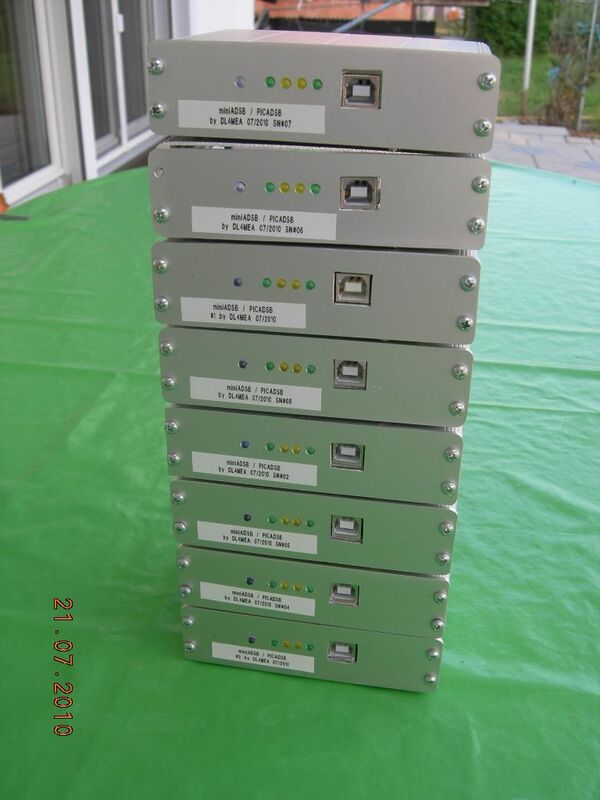 With a slightly modified miniADSB (connector leaving at the bottom) and PICADSB8/9, these 8 units were built. All are already spoken for some friends, but for futher questions how to get one of these units, please scroll down to the chapter "future". A possible transmitter, intended for use on ultralight planes. Basically this is the decoder circuit as introduced by Bertrand Velle with some extensions. After the port enumeration, the power for the PIC and the receiver can be supplied from USB. There are so many decoupling capacitors on the board and I did not see any performance degradation compared to supplying the receiver from an external, high quality power supply. In the current design, and as the kits with pre-soldered FT232 are delivered, the power to the PIC is always on. In case that you do not like this but have the power applied just after enumeration, download the tool from FTDI's web page and reconfigure your FT232 to get permission for 250mA right and switch on power after getting permission from the PC. To make clear how the input connector JP1 is wired. 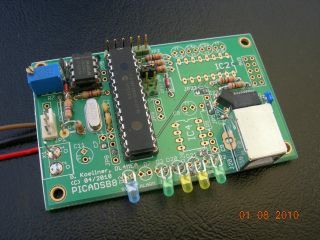 PICADSB7/PICADSB8: The board also includes a comparator circuit around IC30. The reference is built through a low pass filter 470k/56pF. With this, the comparator level is aligned upwards when strong signals are received. The input signal must be shifted below the comparator level, which is done using the poti R7 and resistor R6. Adjust this for highest sensitivty, means a maximum telegram rate at all. PICADSB9: With the experience of the two versions we found that the comparator's reference doesn't raise quickly enough at strong signals. The combination of D31/R33 now does this much quicker, and so does R31 discharge with around 10 times longer time constant. 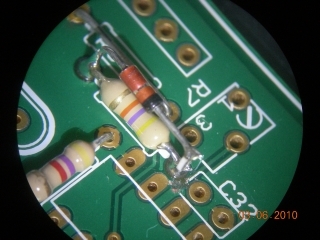 Additionally the biasing is done in a different way now, removing the DC part from the input signal with C12 and re-biasing below the comparator's reference level through an adjustable DC voltage. This will keep the amplitude of weak signals unchanged! This is also close to the improvement suggestion for ADS-B reception which is telling to set the comparator level to the top signal level minus 6dB. More about this further down on this webpage. I regularily see planes in a distance of 220nm with this decoder, and do not have a doughnut effect for the planes passing by for the local Munich airport (and if I say close, they are at around 2nm distance). There is an option to supply an already digital signal to the input. Since this is a very basic system design decision, it is done using a solder bridge on the solder side. In this case that you select this option, ommit at least the poti R7 and R31. 02.05.2010: rewrote R2 (10k) to the parts list. If you are using the standard serial interface with MAX232, setting up the connection to the PC is pretty common and shall not cause any problems. In case that you decided to use the Serial over USB, the operating system will probably ask you to install an USB driver when connecting the unit for the first time. You will find the on FTDI's web page here. After you have installed the driver, open the device manager and check which COM port became assigned to the new unit. That is the number you have to use in your MMI application. There is a transistor on the PCB that allows power switching. Unfortunately the default setting of the FT232 initialisation of the newer devices is different, or my 1st samples were not standard, due to that I connected the power switching device to a wrong pin. If you see both green LEDs on immediately after plugging the USB connector, then you have this issue. If your unit works, don't need to change. If you see reset problems, download the FT_Prog tool from FTDI's web page, and change the setting of IO Controls C2 to PWRON# as shown in this picture. In case that you connect the unit for the first time, for testing purposes, open a simple terminal application to the COM port that PICADSB uses. (Most users have Hyperterm (which cannot handle 1MBit) available, but there are also Teraterm or Putty). DD MM SS 48° 21' 56" 11° 28' 42"
Now, in the terminal application, press 'P' button (capital letter!) and enter the LON and LAT values from these hex values. What is so special with your AD converter? 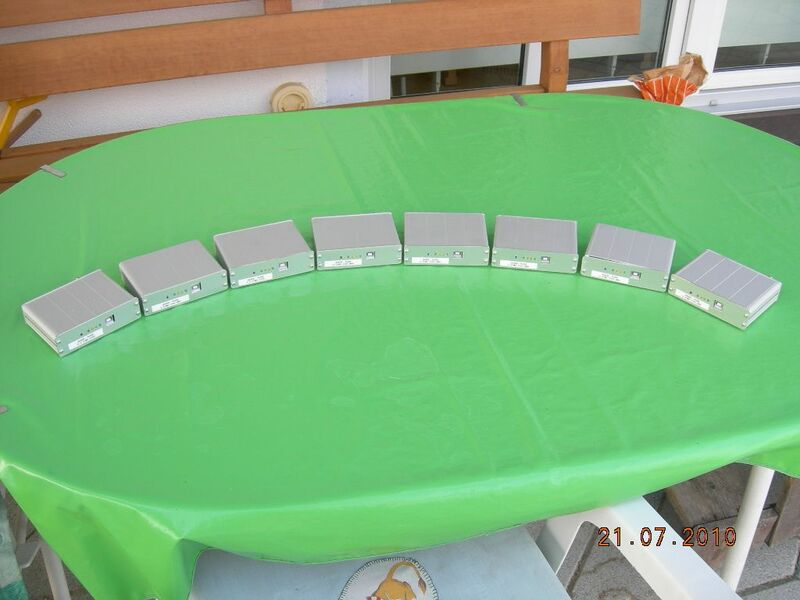 The AD converter is using a very short time constant in order to create the comparator's reference and herewith somewhat aligns to the signal strength, strong signals will be decoded as well as weak signals. I live in the approach path to Munich airport's runway 28L and some planes are even flying over my house. These are decoded as well as planes up to a distance of 200nm. There is no doughnut effect. How can I distribute processing load in the best way? The RxControl software does not receive and decode in parallel due to processing power. Let Planeplotter do the decimal conversion, use the AVR raw format (format '3'). I will get the PIC in the kit preprogrammed. How do I update it later? There are many PIC programmers described in the internet, which allow programming of the PIC. I cannot suggest a special one. If you point me to some descriptions, I can have a look at them and later name them here. 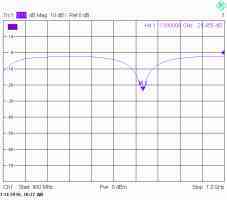 I am using this antenna but with quarter wavelength radials only. Don't know what the author hopes to gain from longer ones. I have measured one on a network analyzer. If you leave the antenna rod in free space (as in the picture below), make the top section about 2mm longer, if you put a 20mm plastic tube over it, shorten the top section by 5mm. I do not know the influence of a wide diameter (50mm - 100mm) plastic tube, maybe this is then just matching the given length. A final note for manufacturing: Take a long wire and put markers for the sections on it: 136mm -> 65.5mm -> 205mm -> 65.5mm -> 190mm. Then first roll the inductors (1.5 turns onto a 9.5mm drill) and second do the 90° bends in order to get it straight. Note: Add a 10kOhm SMD across the input if you are using such an antenna which is not grounded in order to prevent ESD descruction of the SAW and the first amplifier! Another good antenna, which is easy to build (you may leave away the loop with acceptable degradation) can be found on Edward's page. Which connectors and which cable shall I take for the antenna? I suggest using an N connector for it. Do not use silicone for waterproofing, since this never makes it waterproof. There is Spinner PLAST2000, a special more fluid silicone, quite often offered for a reasonable price in eBay. Once you have seen this working, you will never use silicone again. Which cable shall I use and does a preamplifier improve my reception? Which range can I expect seeing planes? Of course this mainly depends on the location of your antenna. Some nearby or flying over planes can be received indoor and with just a screwdriver in the antenna connector once the poti is aligned correctly. We did so quite often just for fun. Otherwise, we've seen planes up to 225nm distance regularily. With PICADSB7/8 and when aligning the poti there for highest sensitivity, it got the doughnut effect. PICADSB9 no longer has this effect, I see the nearby Munich airport (15nm) as well as 225nm distant planes. I do not have a preamp! Just by this I now discovered that the local decoding in Planeplotter is not sufficient because it puts all planes into my own CPR segement, instead of the 5 ones that I really receive the planes. This performance, in my opinion, is incredible! After using the miniADSB receiver together with the PICADSB decoder for a while, we got some experience about the problems of the decoding of the input signal into a processor's digital signal. These problems are known to those who life close to an airport or have a lot of very near flying aircrafts. If you do see planes up to 150nm or even more and if you do not suffer from seeing a gap at nearby planes, please don't read further. Keep it as is and be satisfied. You've been warned. It is clearly visible that the PIC, which samples the input at 25% and 75%, reads a '1' at both times and so does not recognize the sync at all. As you see, the RC combination was made a little bit faster, using R31 (47k) and C32 (82p). But it will even be charged faster using the diode D31 and R33 (4k7). Due to the voltage drop across the diode the reference always stays around 200mV below the voltage peaks. The result can be seen on the right side. The reference level (in the middle) raises quickly and drops slowly. Even in the middle of the signal, it is defined fine in the upper half of the signal; a methode which is also suggested in some official documents. This modification can be done very easily by exchanging components on the PCB and soldering D31 and R33 across R31. NOTE: The modifications are shown for an LM311 comparator. Pins at the MAX942 in PICADSB8 are different! There is another modification visible in the above excerpt from the schematic: The input signal is no longer totally attenuated to go below the comparator's reference. Instead, the AC part is split away from the input and a DC bias is added through a high value resistor. Due to this, especially low amplitude, weak signals, are kept with their worthful original amplitude. For this modification I suggest to bridge R6 in PICADSB7 and PICADSB8. Also, you have to cut two traces: The one that goes from the signal input (JP1, Pin1) to the poti (solder side), and the wire from the poti's slider to the comparator (PICADSB7: solder side, PICADSB8: top side, below the poti). Use a 470k resistor and connect the potentiometer's middle pin to the comparator input. As a check: with a DC voltmeter you now must be able to set the DC voltage at the comparator's input from 0V to 2.5V. WARNING! Last modification is a little bit complicated and you know what you are doing. There is no warranty neither a repair service for damaged boards. R31 is replaced by a standard 47k resistor, the 1N4148 diode is soldered just over it, between the cathode of the diode and R31 there is a small SMD 0805 4k7 recovered from miniADSB because I only install the one between Pin 7 and Pin 8 and ommit the pullup and protection resistor there. Besides the SMD resistors, you can also see the PCB trace cut off that leads from the poti's wiper to Pin3 of the comparator.